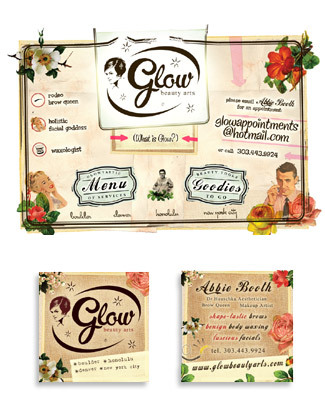 custom website Glow Beauty Arts was being reborn and needed a new look. In a playful collaboration with Glow's It-Girl Abbie Booth, we forged a design to match the company's fresh attitude with a love for vintage candy, beautiful ephemera, and Burt Reynolds. Images here include website screen shots, a business card, a menu of services, and a promotional postcard. Come visit the Glow site live.